A bit more than a year ago, the yokozuna Takanohana retired. 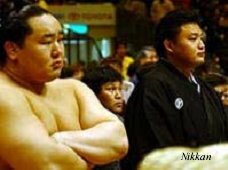 After a fabulous career (22 yusho, and a remarkable popularity among the Japanese audience), he benefited from a rare privilege allowed only to the great yokozuna : remaining in the Nihon Sumo Kyokai as an oyakata while keeping his shikona of Takanohana. As a result, he did not need to get any toshiyori kabu, which can be obtained only through inheritance or by buying one of the 105 available titles. This particular Takanohana toshiyori, however, will disappear after his retirement; it is valid for him only. That is how, just after retiring, he joined the Futagoyama Beya, managed by his father. Futagoyama oyakata was born in 1950. Therefore, he has many years left before he would be forced to leave sumo (at the age of 65, in 2015). However, it seems he has had some health problems recently. Is it because of that, or simply because he wanted to give his son the best possible oyakata start, leading his own heya... 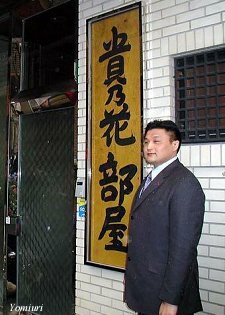 Anyway, this 1st of February 2004, Futagoyama, who had just been promoted to vice-president of the NSK on January 30th, gave Takanohana the leadership of the heya. So after 62 years of existence, the Futagoyama Beya became the Takanohana Beya. Takanohana unveiling the plate of his heya. The Futagoyama Beya still holds the record of 11 sekitori appearing on a single banzuke. 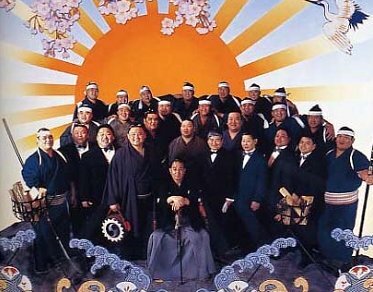 At the age of only 31, Takanohana now leads a well-known heya, with 19 rikishi and three other oyakata (Futagoyama of course, but also Otowayama – former komusubi Takamisubi – and Fujishima – former sekiwake Akinoshima). His first official appearance as the master of his heya came pretty fast; the same day, he participated in Daizen’s danpatsu-shiki. Generally, new oyakata have to go through a long series of secondary tasks before being allowed to assume important responsibilities for the Nihon Sumo Kyokai. But just as Takanohana moved up the ladder very quickly during his career as an active rikshi, he benefited from a surpisingly quick progression as an oyakata; not only is he the master of his own heya, but in February he has also been allowed to assume the role of shimpan, that is to say judge, during the bouts. He will probably not be present during the bouts of the top-ranked rikishi, but such a quick promotion is rare. Normally, an oyakata has to wait four years to become a judge, while it took Takanohana only one year to do so. 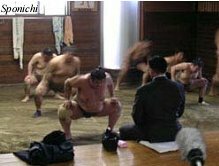 February 8th, 2004: Takanohana shimpan behind Asahoryû: the last two people achieving a zenshô yûshô. Finally, on the 11th of February, Takanohana is present at the practice. He supervises the training for about an hour, energetically, and frequently shouting encouragement. Unhappy with the performance of the makushita Shindo, he even makes him execute 30 push-ups. But even there, Takanohana manages to create a sensation. Indeed, he came wearing a suit and a tie, which is very unusual during the keiko. He explained he had to look serious when he teaches. He also showed that he intends to get fully involved in the practice of his heya’s new rikishi. Takanohana wearing a suit at a training session. The future of the Takanohana Beya? These new rikishi are of great importance for Takanohana! Indeed, far away from the glory days of the 90’s, today there is only one sekitori in the heya : Takanonami (and he will probably not remain a sekitori for much longer...). There is also Gokenzan, who is often sekitori, but we really cannot call him a promising young rikishi... Lower in the ranks, no rikishi seems to be destined for a great future. So it is necessary for Takanohana to recruit, and to recruit fast and well. He has already recruited two new rikishi in February. It is interesting to note that one of them has never done any sumo, but has experience in boxing, taekwondo and judo. Even with a pretty small size (1.75m for 90 kg), it could be interesting to keep an eye on his future progression. Takanohana now faces a great challenge: trying to give all of his lost glory back to his heya. If he manages to do so, no doubt his aura and his legend will continue to grow! A lot has been written about his debut as an oyakata, but we can guess that his mistakes were due to his strength of character. So let’s give Takanohana the final word, which really shows the great will that characterizes him: «As I did when I was active, I’m going to do everything my way».